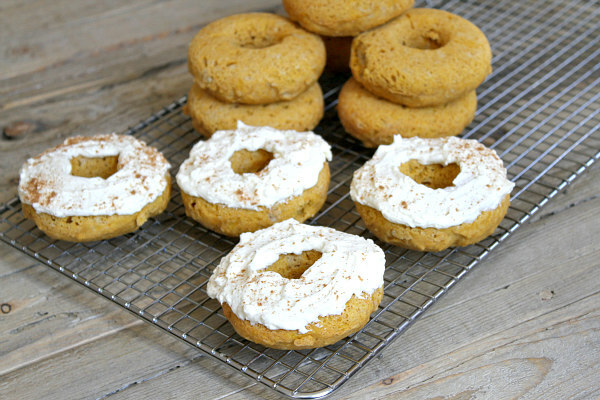 This week I made the perfect fall recipe, Baked Pumpkin Donuts! The temperature is slowly dropping day-by-day… We got our first snow in the mountains today! I am hoping that the ski resorts will open sooner than ever. How cool would it be to ski on Halloween?! My mom has been completely obsessed with pumpkin spice lately… To be honest, she’s driving me nuts! There is pumpkin spice coffee, pumpkin spice kettle corn, pumpkin spice cake, pumpkin spice Cheerios, etc. What’s next?! Pumpkin spice hot sauce?? Pumpkin spice beef?? The pumpkin spice craze must stop! Sure, the pumpkin spice flavor is yummy, but not when every brand jumps on the bandwagon. I am almost positive that there is some variation of every food item in the entire world that has something to do with pumpkin spice in the fall. When will it stop? The world may never know… But we can all thank Starbuck’s for intensifying this modern pumpkin trend! This recipe is perfect for chilly mornings in the fall and winter. If you are part of the pumpkin movement (like my mom), then this recipe will be a grand slam for you. Baked donuts aren’t deep fried, so they are much healthier for you. Why deep fry anything when it can be just as good (or better) after baking it?? I love how the consistency and texture turned out… The donuts are moist, but not too moist. 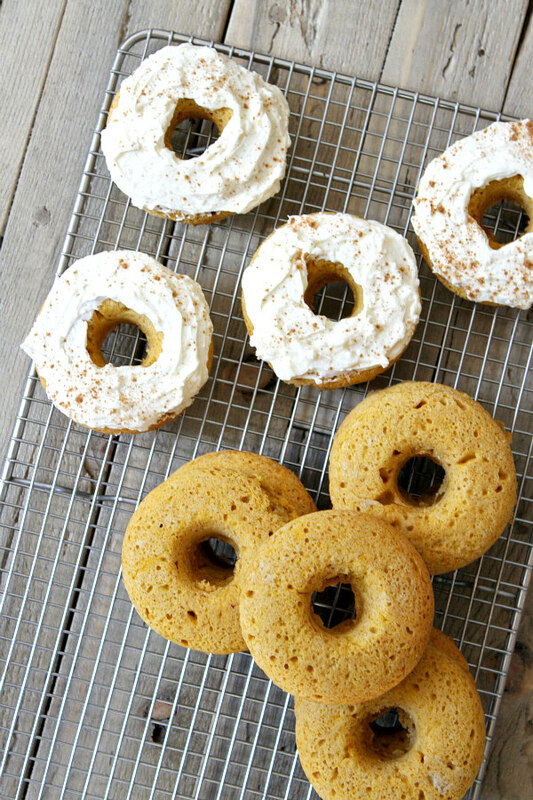 The frosting adds fantastic flavor that enhances the taste of the whole donut. Some things just go hand-in-hand together! Enjoy the first few signs of snow, and what will hopefully be an amazing ski season! P.S. Here is the donut pan that we have: Wilton Nonstick 6-Cavity Donut Pan (in case you need to order one). In a medium bowl, whisk together the flour, sugar, baking powder, cinnamon, salt and nutmeg. In a separate bowl, whisk together the eggs, milk, butter and vanilla. Stir the wet mixture into the dry ingredients- just until incorporated. Stir in the pumpkin. Spoon the batter into the donut pan so that the cups are nearly full. Bake until the donuts are golden brown, about 15 minutes. Remove from the pan immediately and cool on racks until completely cooled before frosting. Repeat with remaining batter and pan. Prepare the frosting: In a medium bowl, beat together the cream cheese and sugar until smooth. Add the cream and beat until creamy and thick for spreading. 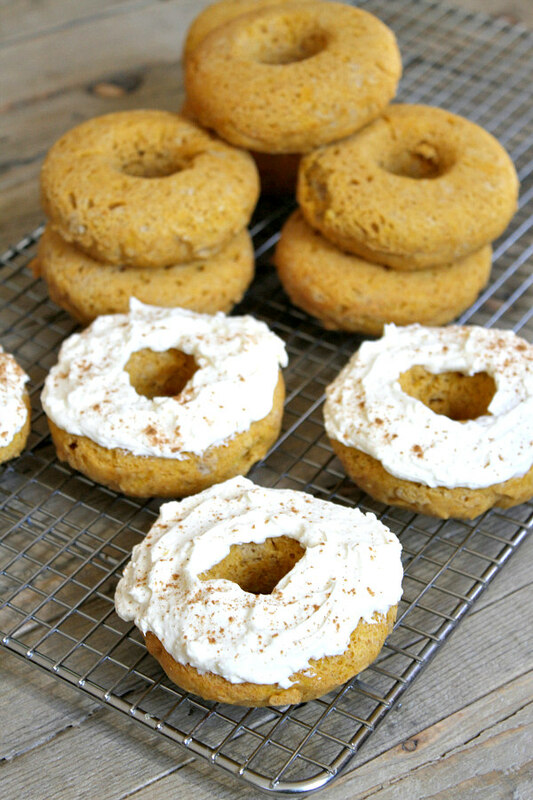 Spread frosting on top of donuts and sprinkle lightly with pumpkin pie spice. 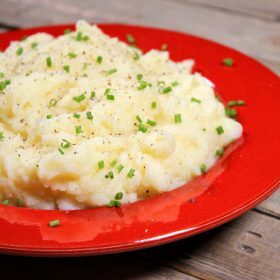 Serve immediately, or store in a covered container in your refrigerator until ready to eat. 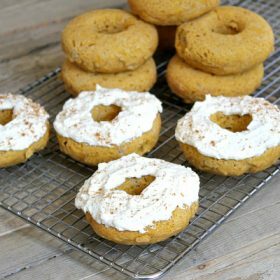 Oh yum, I can’t wait to make these with my grandkids, they all love to help in the kitchen and love donuts of course, thanks for a yummy recipe ! 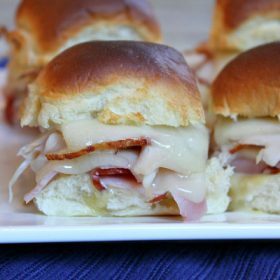 Just discovered your blog and am really appreciating your easy to follow recipes. These doughnuts look great!